Our Iowa State Cyclones Flower Pot Topper Flag includes a 4" (wide) x 8" (length) minature flag and a 6" (wide) x 14" (length) metal flag stand. The officially licensed mini flag is made of single-ply polyester, has screen printed logos (opposite side is a reverse image), and the included stand is made of steel and powder coated black. This mini garden flag kit is perfect to use as a flower pot topper, garden cane topper, garden marker, or flower bed marker. 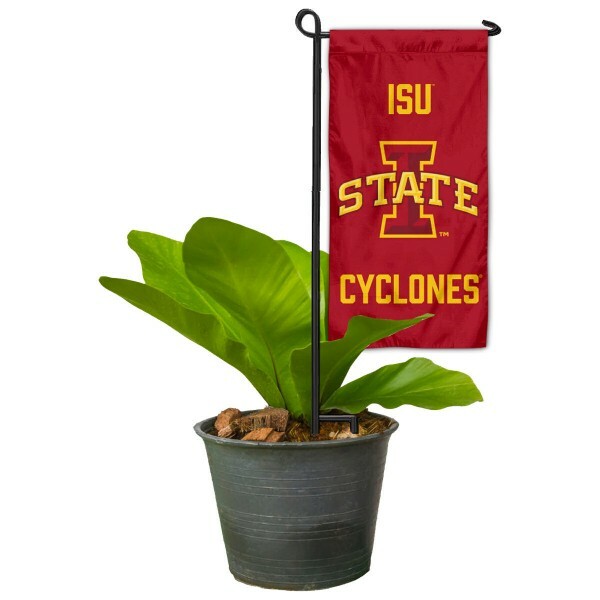 This Iowa State Cyclones Flower Pot Topper Flag is a unique way to display your favorite college team allegiance and a great gift for your gardening friends and family!